Here is a simple fire alarm circuit based on a Light Dependent Resistor (LDR) and lamp pair for sensing the fire. The alarm works by sensing the smoke produced during fire. The circuit produces an audible alarm when the fire breaks out with smoke. When there is no smoke the light from the bulb will be directly falling on the LDR. The LDR resistance will be low and so the voltage across it (below 0.6V). The transistor will be OFF and nothing happens. When there is sufficient smoke to mask the light from falling on LDR, the LDR resistance increases and so do the voltage across it. Now the transistor will switch to ON. This gives power to the IC1 and it outputs 5V. This powers the tone generator IC UM66 (IC2)Â to play a music. This music will be amplified by IC3 (TDA 2002) to drive the speaker. Resistor R6 is meant for protecting the transistor when R4 is turned towards low resistance values. Resistor R2 and R1 forms a feedback network for the TDA2002 and C1 couples the feed back signal from the junction of R1 & R2 to the inverting input of the same IC. The diode D1 and D2 in combination drops 1.4 V to give the rated voltage (3.5V ) to UM66. UM66 cannot withstand more than 4V. CircuitsToday has a list of 4 books for electronics enthusiasts who are looking for a better chance to learn the basics and getter a better practical insight of the subject. These books are written by authentic authors like Forrest M Mims, Charles Platt and so on. You can read their reviews and buy them online here:-Â 4 GREAT BOOKS TO LEARN BASIC ELECTRONICS. The speaker can be a 32Î© tweeter. POT R4 can be used to adjust the sensitivity of the alarm. POT R3 can be used for varying the volume of the alarm. 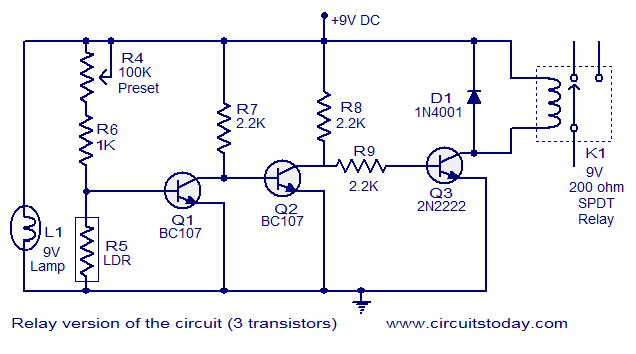 Any general purpose NPN transistor(like BC548,BC148,2N222) can be used for Q1. The circuit can be powered from a 9V battery or a 9V DC power supply. Instead of bulb you can use a bright LED with a 1K resistor series to it. Power supply for the circuit. A well regulated power supply is essential for this circuit because even slight variations in the supply voltage could alter the biasing of the transistor used in the fire sensing section and this could seriously affect the circuitâ€™s performance. A regulated 9V/500mA power supply that can be used for powering the basic fire alarm circuit and its modified versions is shown above. Transformer T1 is a 230V primary, 12V secondary, 500mA step down transformer. D1 is a 1A bridge which performs the job of rectification. Capacitor C1 filters the rectifier output and C2 is the AC by-pass capacitor. IC1 (7809) is a 9V fixed positive voltage regulator. The output of the rectifier+filter section is connected to the input of 7805 and a regulated steady 9V is obtained at its output. S1 is the ON/OFF switch. F1 is a 500mA safety fuse. Relay version of the circuit. Here the above fire alarm circuit is modified to operate a relay when the fire breaks out. The usage of relay makes the circuit able to switch high power warning devices like alarms, bells,beacon lights etc that operates from the mains. Two additional transistors are used with the basic fire sensing circuitry (consisting of Q1, R4, R5 and L1) to attain the target. Whenever the fire breaks out the transistor Q1 is switched ON. The collector voltage of Q1 drops to 0.2V and the transistor Q2 gets switched OFF. This makes the collector voltage of Q2 rise towards 9V and this result in the switching ON of transistor Q3. The relay connected at the collector of Q3 is activated and the load connected through the relay contact is driven. Resistors R7 and R8 limits the collector current of Q1 and Q2 respectively. D1 is a freewheeling diode which protects Q3 from the voltage spikes induced when the relay is switched. Resistor R9 controls the base current of transistor Q3 (2N2222). please can you help me for the relay version of the circuit through the email. why capacitor is connected in series with speaker while circuit is run by dc input….. The TDA2002 IC pin no4 will be at half the power supply (say around 4.5 volts in the above circuit) to avoid this DC flowing through speaker a blocking capacitor is used such that only the audio signal present at Pin no4 alone is fed to the speaker. Function of C2 alone explained in my reply. Hey Bini did u get the project report for this circuit. It wil b great if u help me with it.. Thanks.. Thank you so much for this amazing circuit . NPN Transistor . What changes should be made to the circuit in this case? Email me ur recommendation or reply to my comment . Guys i am going to make the fire alarm project.and i have no large idea for make this project. so i requested to all the internet users and you have any information of this topic so please share me yours information and help me this project. For the power supply circuit, what is the model of the diode that can be used. Wow,its awesome,they have to mention steps of construction with the help of video. Thank you Warsi. We will try to develop videos soon. Please i need an alternative for the um66 since it is difficult to find. I wil appreciate if you can help me out because this is my project topic. Thanks. Hi Doreen you can use electronic peizo alarm from Pin 3 IC1 and 2 by observing the polarity through 100 ohms resistance feed the junction of Piezo buzzer and 100 ohms resistance to Pot R3. i am going to make a project on the fire alram so i want that you should guid me to make this project. i am in confusion that what requriment is for the fire alram so please help. i need to submit this project on next week. i hope that you will short out my problem. can all detectors be wired in parallel/series or what tis the single line diagram illustrating this. how many detctors can we install in one zone and how are they connected to each other ?? Am dealing with the fire alarm Installation and i have some Queries about connection of the Manual Pull station. In our Project we are using NBG -12x Addressable Pull station and the Wiring System in the Catalogue Describes About SLC -ve And +ve of the Fire alarm Panel And the next addressable Device. And the cable we Ordered is they have +ve and -ve wire i dont understand in the described cable which one acts a SLC Wire. Hi guys, am a student in Electrical & Electronic Eng. Post your questions on fire alarm systems, i’ll gladly answer. I am a studen of electrical and electronics engineering.I need a fire alarm circuit with details . hi!i am electronic engineering student. i need details info and circuits diagram of ‘smoke detector with auto water sprinkler’. Hi am a student of electrical electronics engineering with power/machines as my option,pls i need workable power project topics,to construct as my final project.pls u can aid me by sending the topics to my email,,abumbefrancis@yahoo.com. Hi Ajay you can use standard good quality 8 ohms tweeter. any alternative for 32 ohm tweeter..?? want brief explanation in this aspect. pls send me on my id. i m b.tech from the stream electronics & communication. It was my mini project. Thanxxxxxxxxxxx a lot , bcz i hv understood completely this circuit. Now i m very happy. so please i request you to send me the projects via the e-mail which given below and thank you so much! Hi Kart it is just a smoke detector not the temperature detector. the proverb is where smoke is there fire is there. when the smoke passes through the light path between lamp and LDR, it resistance value changes it is detected by the electronics and through relay it can give alarm or the relay contacts can operate a solenoid which sprinkles water during fire. Hi Hanister any audio amplifier IC capable of delivering around 2 to 3 watts of power will do. This IC is a simple 5 lead package with heat sink tab similar to TO220 casing, easy to fit heat sink. is there any replacement for TDA2002 IC for the fire alarm? i want some new innovative projects…. hi?i’m called Lacoste and i’m in final year electronics and telecommunication engineering.i want to do my final project on fire alarm detector,can u plz send the report for fire alarm,and some informations.thx God bless u.
Hi Ban it is a pentawatt package IC. But you can use any audio IC here with suitable PCB. TBA810, LM386, TDA2822, TBA820, any chip which can work with 9 volt and gives an audio output of 1 to 5watts to 8 ohms speaker. is their any circuit for fire alarm using only one ic..
Hi Shubham you can use. the light should be always falling on the LDR R5 whenever smome passes between light and LDR the light ray will get interrupted and the alarm will get activated. is it possible to use light activated switch for this purpose. .
Hi Timmy you can use NE555 oscillator in place of UM66. which Ic or component can i make use instead of UM66 in a fire alarm circuit please I need the reply B=before 24hrs. which Ic or component can i make use instead of UM66 in a fire alarm circuit please I need the reply before 24hrs. which Ic or component can i make use instead of UM66 please I need the reply B=before 24hrs. haii am an ectronics student i want to know more about fire alarm so plz send me detail report of this subject .plz heip us. Hi Syarief this fire alarm is based on smoke detection principle. A light beam falls on LDR, so its resistance is low hence Q1 cannot conduct. once smoke obstructs the light, the intensity of light falling on LDR reduces hence its internal resistance increases. Q1 gets the bias inturn regulator IC1 gets the supply. Regulator IC feeds the supply to tone generator IC its out put is amplified by TDA2002 ic Hence the loud music from the smoke detector indicates that there is smoke. but smoke is normally due to fire. hye…im a student of electrical and electronic engenering..can u send me your fire alarm report..i need the detail..tq..
please,i need a digital calendar circuit diagram project that show days, date,months and years, using discrete components with its operation principle and detail about circuit diagram.send it to my e-mail.thank you very much. hey i implement this circuit today but i was failed to do it properly..!there was a little beep in the beggning but then it stopped.can any body send me schematic diagram of this Circuit? You need to calibrate this circuit before using. Adjust the POT and try again. hi,i am a student of electronics . please send me your project report on fire alarm .i really want 2 study that ..so plzz..e-mail me .. I would like to know abt the names & authors of any text book that contains all electric/electronic circuit concepts. hello sir, i m electronics engineer from pakistan, i want to make a circuit for ups who’s capacity should be atleast 1000watts. I am an electronic student and i would like you to send me some information on how to design a smoke alarm sensor. Industry or home already has lights. So does the LDR gets affected and what is the role of LDR. Smoke alarm using LDR and bulb and preset what is the significant role of ecah. Please mail to my email-id. Pls I need 1000watts and 2000watts comprehensive circuit diagram for an inverter/ups. Thanks. God bless you. Yes you can if you so desired. It would be a bit pointless though as the purpose of using a pot and not resistor is so that you can adjust the signal. thanks sir i want’s that it’s my requared for my project. Can we use a resistor insted of pot? Plz i want to build a 2000Watts inverter pls send me the circuit diagram and the rating of the components required to my email address.which is geracotin2000@yahoo.co.uk. thanks. Nice easy fire alarm circuit and its operation is simple.I like the circuit and expect i do it. what should be the value of the ldr?? or its range?? i am an electrical/electronic student,and i am very good at reading circuit and constuction,please i want you to send the fire alarm circuit that made by micro . Any replace ment for UM66 and TDA2002? i am an electrical/electronic student,and i am very good at reading circuit and constuction,please i want you to send the fire alarm circuit and its working principle,so i can construct one.thanks.hoping to recieve it in my mail provided to you. Hello I am an Electrcal /Electronics Eengineering Student, Ineed some Projets espeially Automatics, sensing & control circuits please. P.O.Box 7136 Bompai, Kano Nigeria.